Glee is a musical comedy-drama television show. This American teen series airs on the Fox network. The focus of the story is on the William McKinley High School’s glee club called the New Directions. The members compete on show choir competitions while dealing with issues concerning relationships, sexuality and social issues. The original Glee cast includes Matthew Morrison as Will Schuester, glee club director and Spanish teacher; Jane Lynch as Sue Sylvester, the cheerleading coach and Will’s arch nemesis; Jayma Mays as Emma Pillsbury, the school’s guidance counselor; and Jessalyn Gilsig as Terri, Will’s wife. The members of the New Directions are Lea Michele as Rachel Berry, Amber Riley as Mercedes Jones, Kevin McHale as Artie Abrams, Chris Colfer as Kurt Hummel, Jenna Ushkowitz as Tina Cohen-Chang, Mark Salling as Noah Puckerman, Dianna Agron as Quinn Fabray and the late Cory Monteith as Finn Hudson. The cast continues to expand. Glee covers several songs and the characters sing these songs onscreen. Ryan Murphy, the creator of Glee is the primary person who selects all the songs performed in the show. He ensures that there is balance between show tunes and chart toppers. The song choices are essential in developing the script for every episode. The rights to the songs are cleared by music supervisor P.J. Bloom from the publishers before these songs are re-arranged by Adam Anders and Peer Astrom, both music producers. Zach Woodlee, on the other hand, is the main choreographer of Glee. He strategizes the accompanying dance moves for at least four production numbers per episode. Most fans prefer hearing songs that are re-arranged as close as possible to the original ones. Some of the best Glee songs are the enumerated below. The New Directions performed this song wearing white shirts with printed statements that are unique about each glee club member. That particular number and episode encouraged teenagers to love the things that make them different from other people. Glee had a tribute for Michael Jackson. The best song in that episode is Smooth Criminal sung by Santana (Naya Rivera) from New Directions and Sebastian (Grant Gustin) from the Warblers. The duet was breathtaking and the choreography was simple yet momentous. They were in a room filled with chairs with a band playing live music. As of today, A Thousand Years sung by Marley (Melissa Benoist) and Jake (Jacob Artist) is the best duet of a love song. Their cover did not have much difference from the original song but it was filled with feelings. The New Directions’ cover of Keep Holding On is one of the most emotional songs ever recorded in Glee. The club members sang this to offer comfort and support to Quinn who was pregnant at that time and was kicked off her house and the Cheerios. 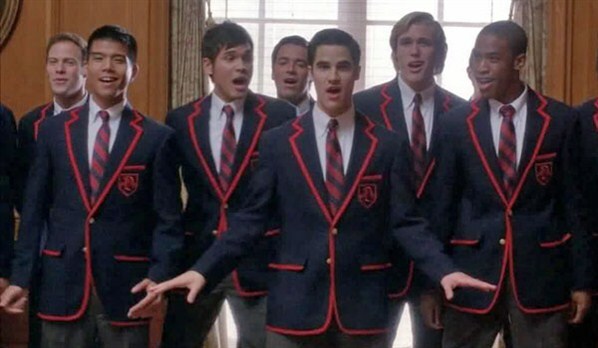 The Glee club’s cover of Don’t Stop Believing on the first episode of the series is the most memorable song. Aside from the obvious message of the song, the fans also loved how the original club members Rachel, Tina, Kurt, Artie and Finn performed the song while wearing red shirts. To view our top ten list of the best Glee performances of all time, click here.